Organizations today grapple with the expansion of distributed computing, increased online collaboration, explosive data growth and heterogeneous IT environments—all issues that make information security more critical, yet more complex than ever. Moving data to a virtualized, cloud-based environment can help develop and manage a more flexible infrastructure, and reduce operational costs and total cost of ownership. In addition, a virtualized environment can help accelerate time to market through increased efficiency and automation; scale operations to meet market dynamics and business strategy; and virtually eliminate downtime. The question, therefore, is not whether to move to the cloud—it’s how to do it while protecting critical data. Not surprisingly, the level of data security depends largely on which platform supports the cloud environment. 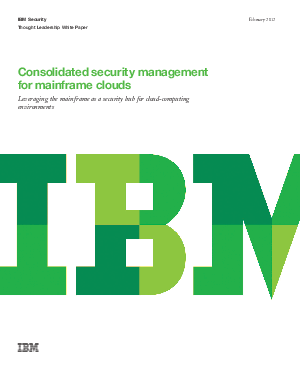 The mainframe has a strong heritage of being an extremely secure platform for virtual environments and workloads, and offers a compelling alternative to massively scaled-out environments often deployed in the cloud—particularly in the realm ofsecurity. Also, many organizations are already using a mainframe as their data hub running key applications, providing a natural jumping off point to create a security hub for the entire enterprise. From automation to advanced virtualization technologies and open industry standards, IBM System z® mainframes help deliver a solid, secure foundation on which to build the virtual environment. They support expandable cloud environments with industry-leading security, as well as availability, performance and cost-effectiveness. These benefits are particularly valuable on today’s smarter planet, where instrumented, interconnected and intelligent businesses collect, process, use and store more information than ever before.